This past week there’s been a lot of events opening of course. Too many things for me to keep up with so I’ve tried to select things to do that I think will be fun, or helpful through the holidays. One thing that is always fun is the gift giving thing. Real life or Second life we like to think of those we care about on and off throughout the year while this time of year seems to be -the- time most people do it isn’t always easy to find ways to express that or do that within Second Life. Two events that I tossed my time into is Twisted Krissmuss and then Christmas on 34th Street. Both events are different in the sense that all items are transferrable so you can actually wrap and give someone a gift rather than drop something on them through marketplace or a vendor. Imagine wrapping up a gift and placing it under the tree to taunt and tease. It’s half the fun don’t you think? Of course I have that sadistic fun side to gift giving. 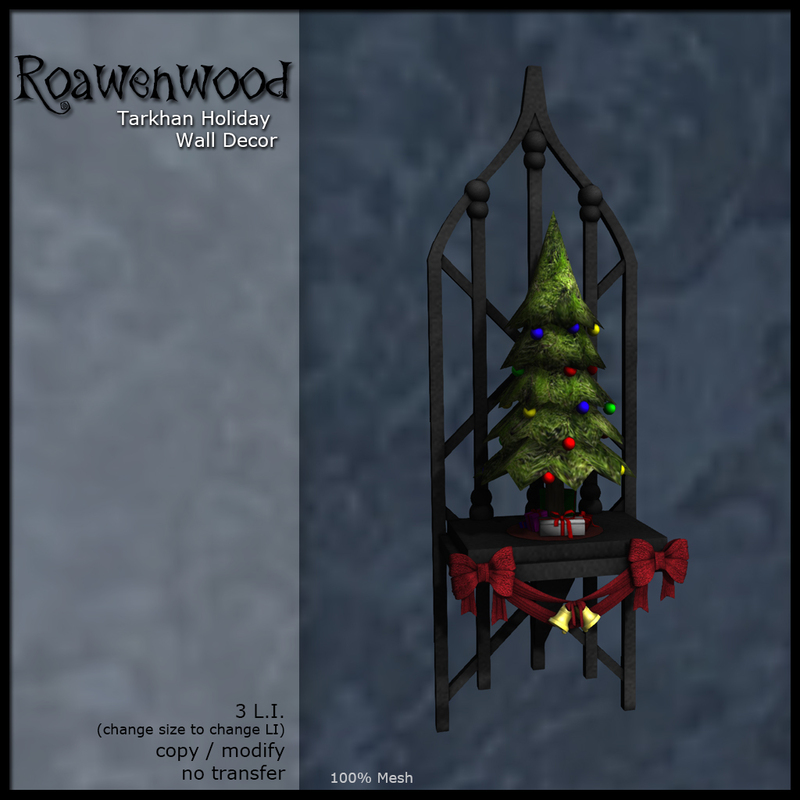 So I have some new things to show you… and they are transfer/no copy items for the holidays. When I was small I actually went caroling. We would walk through town singing, a group of people and at the end of it we would all congregate at the fire station where they had cocoa and such waiting to warm us. It was an event they did every year and I remember shivering in the cold going house to house the promise of hot chocolate making the night feel something magical as people would listen, propping open their doors or braving the cold to stand on their porch, some grabbing their coat to join us as we walked. Sounds very Charles Dickens doesn’t it? *laughs* Well, it was an interesting experience and something I have thought about… with my rather Romantic nature carrying it through the years of pleasant memories I have on occasion passed along the thought in my Second Life creations and this year I’ve updated a wee bit. This is a special transfer version. 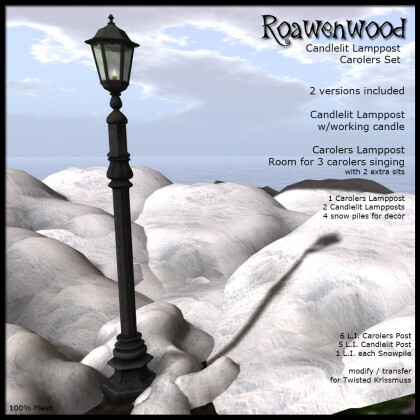 The Candlelit Lamppost set that includes one lamppost scripted to have up to three carolers singing alongside each other. It gives a book of music to hold as you sway singing. There’s also a few snow piles you can toss around if you like, and two extra lampposts for decor. The pack is only 100L and you can have it if you go to Twisted Krissmuss (TAXI TO BE ABLE TO GO) . For Christmas on 34th Street there are 3 new things you can get. One a 10L gift that is copy/no transfer and then two transfer/no copy items for gift giving in the booth that I have. The first is something some decorative trees, a simple item. 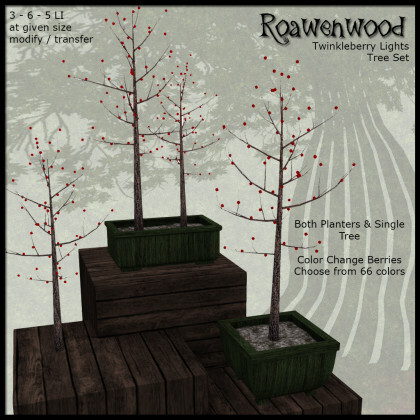 I called them Twinkleberry trees because I thought it was cute. The pack has three different trees in it, each one has the ability to have the color on the berries change from 66 different shades. So you can technically have them however you want. There’s two planters…. and a single tree without one. Granted, this sort of thing is much nicer when it is copy however the price is rather cheap and reasonable so you’d have a few. I’m going to possibly do a copy/no transfer version in the store just to have as well for those who might prefer it however right now they are exclusive to the event. 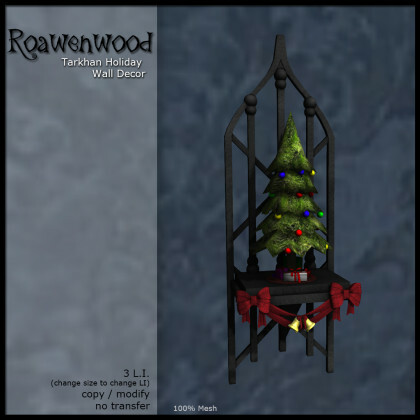 The second gift giving item is a variation of the sconces I made for We <3 RP. The Tarkhan set is something that I’m enjoying working on and have intentions to expand I think. I love things that all work together so much, I just can’t help myself. The sconces are rather pretty really done in holiday colors of reds and greens. I know I could do other ones but I just love a nice red. It’s probably one reason why the holidays are some of my favorite decorating opportunities. 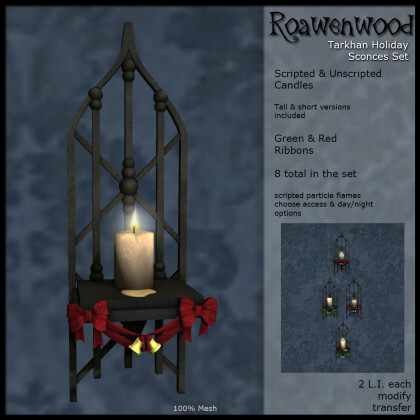 The bowed version with candle is the transfer item. If you look at that picture you’ll notice that you get _a lot_ of them in the pack LOL. There’s red and green variations for each size of candle. Since there is a tall candle and a short candle, scripted and non scripted versions you get 8 in there. Most people probably wouldn’t want more than that I would imagine. So giving a bit of holiday cheer. I have a few other items that I’ve had around also in the booth, not as much as I would have liked to have but it’s been a bit rough finding time to be online this season. The second thing pictured there is the 10L gift that I mentioned. It’s a cute little thing. For your wall, and sized fairly well. 10L and copy! It’s under one of the holiday trees at the event so you will have to find my box to get it but the trees are easy enough to spot I think. So TAKE A TAXI to Christmas on 34th Street! Blog Post for Christmas on 34th Street with Map!